Get a closer look at the striking slot canyons and desert landscapes of the American Southwest on this 10-hour day trip from Flagstaff. Shop for Native American art at the historic Cameron Trading Post, marvel at the postcard-perfect views from Horseshoe Bend, and explore the sandstone walls of scenic Antelope Canyon, plus much more. A boxed lunch is also included. The focus is on Navajo land, history, and culture on this off-road desert adventure from Flagstaff. Receive a morning pickup from your Flagstaff hotel, after which you’ll transfer out of town and up onto the Colorado Plateau, offering views of the ancient San Francisco Peaks which tower more than 12,600 feet (3,800 meters) above the desert below. Continue your sightseeing drive by passing through the Painted Desert, stopping by the Cameron Trading Post where you can purchase a variety of artwork crafted by the local Navajo, Zuni, and Hopi tribes. 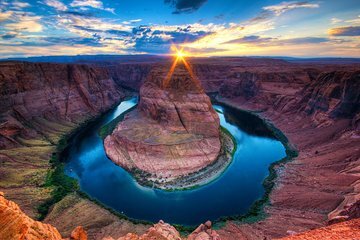 You’ll proceed from here to Horseshoe Bend, a renowned clifftop overlook that looks down more than 1,000 feet (300 meters) to the river flowing below. Leaving Horseshoe Bend, head to Glen Dam, where you’ll receive an included box lunch to enjoy surrounded by views of Glen Canyon and Lake Powell. Finish by stepping inside Antelope Canyon, a sandstone slot canyon formed by thousands of years of erosion. You’ll end your excursion with a drive back to your hotel in Flagstaff, watching as the sun casts a fiery glow across the Painted Desert landscape. We were extremely pleased with this tour! Our guide, Allen, could not have been more friendly and personable. He remembered our names and did several personal touiches around his Indian heritage. The tour itself was a long drive, but Allen gave a good informative narrative along the way. The actural locations were so beautiful, especially Antelope Slot Canyon. This is a unique experience, unlike anything I've ever seen, and our Navajo guide there did an excellent job, also. I would highly recommend this tour. Worth every penny! This tour is not to be missed! We could not have asked for a better guide and the tour was out of this world! Highly recommended!!! Great tour. Saw exactly what we had hoped to see, then some. Expect a long day from Flagstaff 11.5 hours even longer from Sedona we had Sedona folks on our bus. The bus held 14 people and was comfortable. Lunch was served and was good. The tour guide was fantastic.